When an irresistible smell of this delicious soup starts spreading from the kitchen, all of your senses will be awaken in a flick! 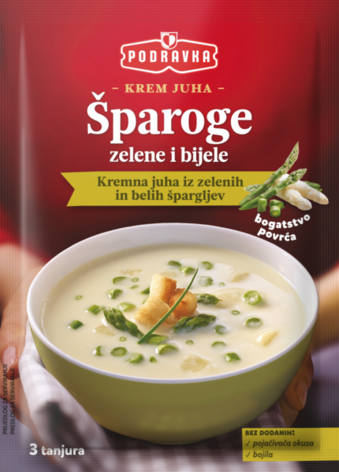 Fine creamy texture and full taste, enriched with pieces of white and green asparagus, chive rings and natural spices, no added flavour enhancers and colours. Go ahead, discover what lies behind the delicate fragrance - true delicious thrills for your palate are waiting for you in every spoon! Preparation: Empty the contents of the package into 750 mL of lukewarm water and stir with a whisk until the soup boils. Simmer for 5 minutes, stirring constantly. Ingredients: palm oil, wheat flour, potato starch, dried white asparagus 8.7%, table salt, corn starch, lactose, sugar, skimmed milk powder, yeast extract, flavor, milk protein, dried green asparagus 1,6%, dried onion 0.6%, chives, spices, acid (citric acid). May contain eggs and celery.